Roland Valentine Sutton, known as Val, was born in 1882 at Stoke sub Hamdon. He was the son of leather glove cutter Rowland Sutton (b 1858) and Ellen née Moore (b 1856), originally from Weymouth, Dorset. In the 1891 census Rowland and Ellen were living at 2 North Terrace with their children; Henry J (b 1881), Valentine R (rather than Roland V), Fred KJ (b 1883), Arthur C (b 1885), Beatrice E (b 1886) and Ethel L (b 1889). In the winter of 1907 Val married Lizzie Maud S Hunt at Yeovil. In the 1911 census Val and Lizzie were living at 6 North Terrace, Newtown with their two-year old son Reginald Charles. Val listed his occupation as a leather glove cutter. He worked at Whitby's leather factory in Middle Street. They were later to move to 4 Mount Pleasant and have another child. Val enlisted at Yeovil in January 1917 (Service No 203264), joining the 6th (Service) Battalion of the Somerset Light Infantry. After undergoing training at Boscombe and Sutton Veny, he was drafted to France during March 1917 in time to take part in the Second Battle of Arras. The second battle of Arras (9 April-16 May 1917) was the British contribution to the Allied spring offensive of 1917. The French would attack on the Aisne, the British around Arras. The British attack would start first. It would involve troops from three armies. In the north the Canadian corps of the First Army would attack Vimy Ridge. In the centre of the line the Third Army would attack from Arras. Finally, the British Fifth Army would attack on the right of the line. The attack on Vimy Ridge was one of the best planned British offensives of the war. General Byng, the British commander of the corps, made sure that his men were well trained and knew their role in the upcoming attacks. Twelve tunnels, one 2.5km long, were built leading up to the front line to protect the troops during their approach to the lines. On 9 April the Canadians stormed out of their tunnels and captured the ridge on the first day of the battle. By 13 April the Germans had accepted the loss of the ridge and pulled back to their third line of defences, the III Stellung (the Oppy-Mericourt Line), four miles further east. The Third Army had also constructed a tunnel system, taking advantage of the underground chalk quarries at Arras. The entire British attack was supported by 2,879 guns each of which had close to 1,000 shells. The German commander on the Arras sector, General von Falkenhausen, believed his position to be too strong to be taken in a single day, and so had placed his reserves some fifteen miles behind the front lines. When VI Corps of Third Army launched its attack on 9 April they were able to overwhelm the German front line, and in some places advanced more than three miles. Only to the south was progress limited. The British attack had made impressive progress, but it had not achieved a breakthrough on the first day. This allowed the Germans to rush their reinforcements into the gap, launching a series of counterattacks and slowing down the British attack. A renewed British attack at Bullecourt (11 April) failed to make any progress and the attack was suspended. The British renewed their efforts around Arras on 23 April, but even a well planned second battle of Bullecourt (3-17 May) failed to make any real headway. Haig then cancelled the Arras offensive and turned his attention back to his favoured sector of the front in Flanders. The month of fighting around Arras cost the British 84,000 casualties and the Germans 75,000. Tactically it was a clear British victory and the seizure of Vimy Ridge was a significant achievement, but the overall plan had failed. Neither the British nor French had been able to achieve the breakthrough. All of June and much of July was relatively quiet for the 6th Battalion but from the date he was killed, 22 August 1917, it is known that Val Sutton took part in the Third Battle of Ypres. 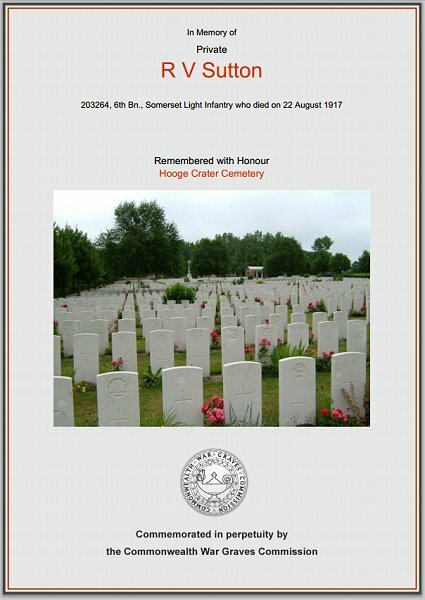 Val Sutton was killed in action on this day, 22 August 1917. He was aged 35. This same day, and in the same action, another Yeovil man Sidney Hawker was reported missing in action, presumed killed. On 7 September 1917 the Western Gazette reported "His many friends in the town will regret to learn of the death in action in France on Thursday August 23rd of Private RV (Val) Sutton (Somerset LI), husband of Mrs Sutton of 4 Mount Pleasant, Newtown, third son of Mr R Sutton of 43 St. Michael’s Road. The information was sent to his wife by Second Lieutenant H Frampton, the officer commanding, in the following letter which was received on Friday morning:- “ I very much regret having to write to inform you of the very sad death of your husband, Private RV Sutton, who was killed in action on August 23rd during a splendid attack. He was killed instantly during the advance and suffered no pain. I am indeed sorry to lose him, as he was an excellent soldier, willing and energetic. Please accept my sympathy, together with that of the officers, NC officers and men of the Company.” The late Priv. Sutton joined the Army in January of the present year, up to which time he was a glove cutter at Messrs. Whitby’s. After undergoing training at Boscombe and Sutton Veny, he was drafted to France during March last. He was keenly interested in sport, and was a playing member of the old Harlequins Football Club and had served on the Committee of the Yeovil Town Club. He was also a member of the Loyal “Alexandra” Lodge of Oddfellows. Of a quiet but genial and straightforward disposition, he won a large circle of friends, who have expressed the greatest sympathy with the widow and two young children who are left to mourn his death - In his younger days deceased was connected with the Newtown Primitive Methodist Sunday School and afterwards with the Wesleyan Young Men’s Bible Class, and at both places of worship on Sunday, the pulpit was draped with the Union Jack, and Mr G Bird, leader of the Wesleyan Class referred to the sad event. The late Private Sutton was 35 years of age. He has two brothers, Arthur and Fred, discharged from the Army, Arthur having been wounded at Mons, and discharged in consequence, Percy the youngest brother, in India with the local Territorials, whilst the eldest son Harry, is at Lowestoft. At a meeting of the Loyal Alexandra Lodge of Oddfellows on Tuesday evening a vote of sympathy was passed with the widow, and a resolution recording the loss of a respected and valued member was passed in silence." 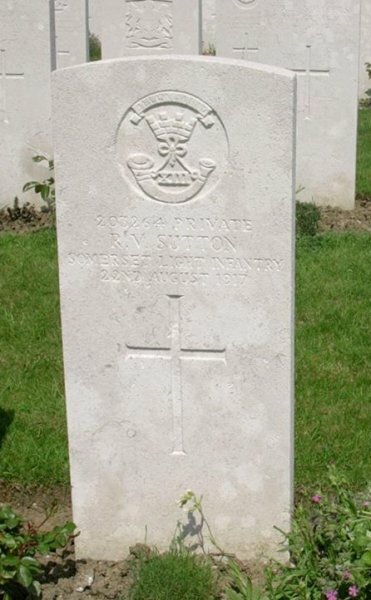 Private Val Sutton was interred in Hooge Crater Cemetery, Leper, West-Vlaanderen, Belgium, Grave VII.D.10 and his name is inscribed on the War Memorial in the Borough. The Commonwealth War Graves Commission certificate in memory of Val Sutton.